Daniel practises in civil litigation including general commercial litigation, shareholder disputes, anti-competitive trade practices, personal and corporate insolvency, consumer protection, property (including acting for and against lenders in claims for possession), debt recovery and enforcement and family provision claims. 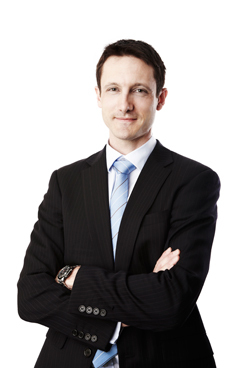 Daniel acts for litigants in all jurisdictions in New South Wales and in the Federal Court of Australia. He has also appeared as an advocate in all of those jurisdictions. In the area of dispute resolution, Daniel has a proven track record in assisting clients to resolve commercial disputes without recourse to litigation. In addition to his litigation practice, Daniel also advises clients in relation to various areas of law including intellectual property and compliance with the Competition and Consumer Act. In the area of intellectual property, Daniel has a particular interest in trade mark law and has successfully managed numerous trade mark applications through objections by IP Australia and oppositions by third parties. Daniel is an affiliate member of the Society of Trust and Estate Practitioners. Daniel’s interests include looking after his two young boys and when time permits, reading and keeping fit. He also volunteers as an age manager for Nippers at North Curl Curl Surf Life Saving Club. Prior to becoming a lawyer, Daniel was a soldier in the Australian Army and was deployed overseas twice on operations.